Seward, (Anchorage’s gateway) is sandwiched between the Kenai Mountains and the Kenai Fjords National Park. It is one of Alaska’s oldest and most scenic communities, with Mount Marathon rising majestically behind the town. Even though Anchorage is Alaska’s largest city, it is also home to 1,500 moose, surrounded by national parks full of wildlife. 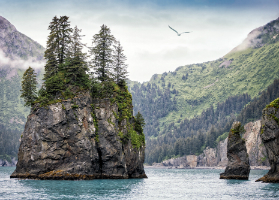 Today is a day of wonder as you cruise the Kenai Fjords, Alaska’s smallest national park. Carved by glaciers flowing from the Harding Icefield to the sea, Kenai Fjords has a rugged arctic landscape and is a rich habitat for marine animals and other wildlife. Most cruise lines don’t go here so enjoy this unique opportunity and you can even take an optional expedition excursion here. As with all Alaska, what you’ll be able to see is subject to weather and ice conditions. Sitka is one of the oldest and most culturally significant communities in Alaska, filled with rich Tlingit, Russian, and early American settler history. Sitka is famous for its spectacular scenery, abundant wildlife, the copper-domed St. Michael’s Cathedral, the Pioneer Home and the Russian Bishop’s House. It contains 22 buildings listed on the National Register of Historic Places and is where the contract of sale was signed transferring Alaska from Russia to the United States. Managed by the Forest Service, these scenic Inian Islands are located in Icy Strait near the entrance to Glacier Bay. Several small pieces of land make up these islands, with dense tree growth that provides a restful home to deer. This has become a popular area for sea kayaking. Privately owned Icy Strait Point is a tourist destination and the only privately owned cruise destination in Alaska. It is the property of 1,350 Alaskan natives with aboriginal ties to Hoonah and the Glacier Bay area. Visitors here enjoy an educational experience learning about Alaska's native cultures, and the natural history of the region. There is much to do here including a brown bear search, tram excursion, flightseeing over Glacier Bay and the biggest zipline in the United States. 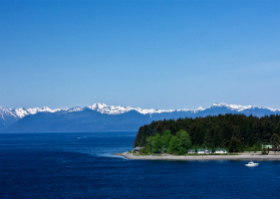 Privately owned Icy Strait Point is a tourist destination and the only privately owned cruise destination in Alaska. It is the property of 1,350 Alaskan natives with aboriginal ties to Hoonah and the Glacier Bay area. Visitors here enjoy an educational experience learning about Alaska's native cultures, and the natural history of the region. There is much to do here including a brown bear search, tram excursion, flightseeing over Glacier Bay and the biggest zipline in the United States. Located on the Gastineau Channel in the Alaskan panhandle, Juneau sits at sea level below steep mountains between 3,500-4,000 feet high. Atop these mountains is the Juneau Icefield, a large ice mass from which about 30 glaciers flow, and two of them – Mendenhall Glacier and Lemon Creek Glacier are visible from the local road. 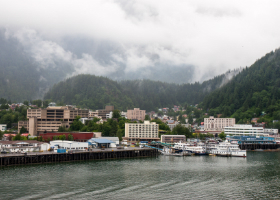 A unique feature of Juneau is that it is the only U.S. capital that has no roads connecting it to the rest of the state. 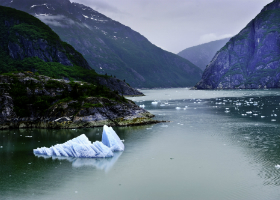 Stunningly beautiful Tracy Arm is a fjord 45 miles south of Juneau that actually consists of two deep and narrow fjords – Tracy Arm and Endicott Arm. Both fjords are over 30 miles long. At the end of Tracy Arm are the impressive twin Sawyer Glaciers. 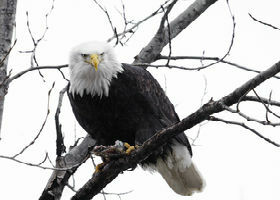 Wildlife in the area includes black and brown bears, deer, wolves, harbor seals and a variety of birds. What you'll be able to see today and how far we can travel up Tracy Arm is weather and ice dependent. 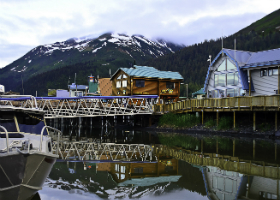 One of the oldest towns in Alaska, Wrangell is located near the mouth of the Stikine River. Much of its history can be seen in the impressive collection of totems scattered throughout the town. 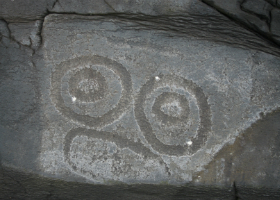 Highlights here are the amazing Petroglyph Beach State Historic Park where you can find primitive rock carvings and just 30 miles away is the Anan Wildlife Observatory with the largest pink salmon runs in the Inside Passage, and a platform from which you can look for eagles, harbor seals and black bears. Misty Fjords, with its gorgeous views of natural formations is a national monument and wilderness area with steep valleys formed by glaciers and lava flows. 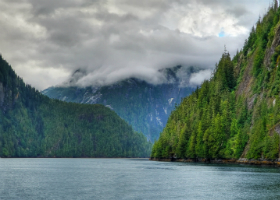 It is part of the Tongass National Forest and is about 40 miles east of Ketchikan along the Inside Passage. With its icy blue lakes, waterfalls, snowcapped peaks and glacial valleys literally everywhere you point your camera you will get a postcard picture, depending on the weather of course. For a more up-close opportunity in this beautiful scenic sanctuary optional expeditions excursions will be available. 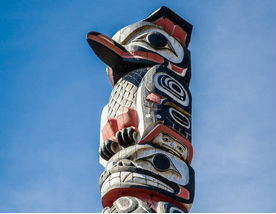 Dubbed the Salmon Capital of the World, Ketchikan is the southeastern-most town in Alaska and is home to the world’s largest collection of standing totem poles that are found throughout the city and at four major locations: Saxman Totem Park, Totem Bight State Park, Potlatch Park, and the Totem Heritage Center. 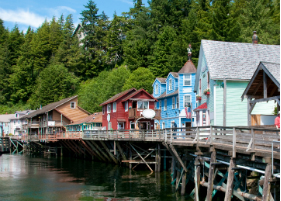 Other attractions of Ketchikan are Creek Street, a boardwalk road built on pilings over Ketchikan Creek and the Waterfront Promenade that skirts the bustling shoreline with inviting whale-tail benches to take in the view. 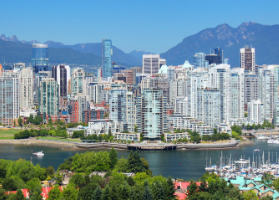 Today we cruise the fjords of Canada’s Inside Passage boasting centuries-old coastal rainforests, beaches, waterfalls and mountains. 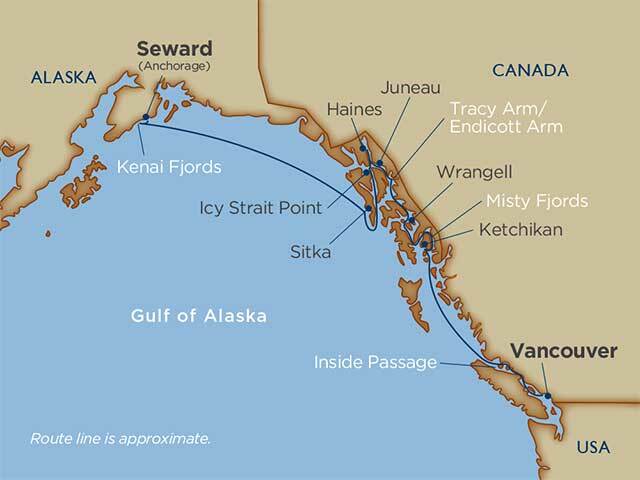 Over 25,000 miles of rugged coastline lie in Canada’s Inside Passage, joining Alaska’s 15,000 miles of inside waters and provides a safe and sheltered West Coast waterway transit. 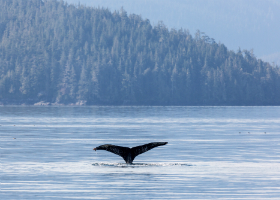 In this isolated wilderness look for coastal First Nations longhouses fronted with proud totems and a variety of marine life, from orcas and porpoises to some of the largest populations of bald eagles in the world.